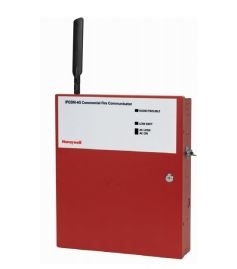 The Honeywell Power IPGSM-4G is a commercial fire alarm communicator that offers contact ID reporting to any Fire Alarm Control Panel (FACP) with a built-in dialer. The dual path communicator connects directly to the primary and secondary communication ports of a fire panel's Digital Alarm Communicator Transmitter (DACT). It offers three selectable reporting paths which include: Cellular only, IP only, or IP primary/cellular backup. All signals from the IPGSM-4G are delivered to Honeywells AlarmNet Network Control Center, which routeshighly encrypted Ethernet data packets via a customer provided internet connection or cellular network to the appropriate central station. The IPGSM-4G is designed to operate over the most common cellular networks including 2G,3G and 4G. Its multi-GSM platform technology automatically chooses the best available cellular signal in the area based on signal strength and seamlessly self-adjusts to maintain critical life safety communication. Saves the cost of two dedicated phone lines. central station using cellular technology, internet, or both. Operates over the following communication protocols: HSPA+ (4G) HSPA (HSDPA & HSUPA) (3G), EDGE (2G GPRS) (2G). Works over any type of customer provided Ethernet 10/100 based network connection (LAN or WAN), DSL modem or cable modem. Data transmits over standard contact-ID protocol but is secured with the industry's advanced encryption standard (AES 256 bit). Built-In Power Supply module: On board charging circuit design accommodates backup battery. Includes primary power and battery supervision. Diagnostic LEDs: Signal strength and status indicators. Reliable connection: IP and GSM connection tested every day. QOS: Quality of Service diagnostics via AlarmNet conveys vital communicator information including when message was received, signal strength, and message path used. 7720P Hand-held programmer for easy setup.